Welcome to Nallikari Winter Village! Winter Village is full of action for families and children from February to April. Besides all the action, Winter Village is excellent place to get familiar with building with show and ice. Just walk on the ice fo Bothnic Sea is something that foreign visitor will remember for ever! Nallikari Winter Village has been venue for many events, such as Nallikari Winter Beach Volley, Tour de Liukuri, Puppet theatre, snowman competition etc. Opening hours 9.2.-31.3.2019 on Sat-Sun 11-16. Also week 8 Thu-Sun 11-16 and week 10 every day 11-16. Free entrance to Nallikari Winter Village. 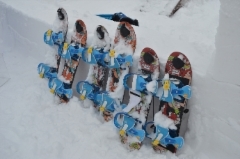 Following activities are free of charge: ski tracks for children, adventure tunnels, and hoijakka-sledge sledge. Hot drinks, sausages and donuts! Also various groups enjoyed activity programmes in Nallikari Winter Village. Outside the opening hours, Nallikari Winter Village is available for groups on request. All equipments are rentable from Nallikari Holiday Village's reception (Leiritie 10, Nallikari) during opening hours.